Wow! What a week. Sorry for no blogs but the computer was out for a tune up. Talk about crazy…this writer was not happy. This is short and sweet, but I promise some romantic food ideas (not dietetic) next week for Valentine’s Day plus some other interesting things. Now let’s discuss improvements at the Dancing Dog Ranch. Stroke of Genius has been working hard fixing up what’s around here. There are many things that just need a little attention, including me. Unfortunately, he’s like a big brother. Oh well, at least he doesn’t cuss when he fixes things. 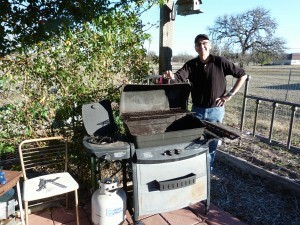 This week he tackled the $20 gas grill I bought at a garage sale. I wanted it because it has a side burner and I love blackened chicken and fish. When I try that in the house, it sets off the fire alarm. Sorry, I can’t show you the after shot yet, but I will in due time. First off, this thing needed to be cleaned on the inside. 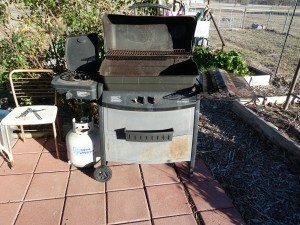 Also, it didn’t have a cord to connect the propane to the grill, so we went to the Big Fix It store and bought one. Stroke of Genius cleaned it all, washed it out and has big plans for this beast including a paint job and a custom Dancing Dog Ranch sign. Quite impressive. First SOG moved it to The Crazy House in The Funny Farm. Then he hooked up music and a light so we’re getting fancy out there. The wireless router I bought for the house means that now The Funny Farm has WI-FI. Okay, now even, I’m getting impressed. 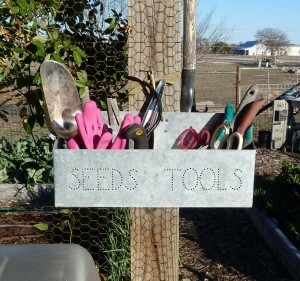 Then he hung up my gardening tools. Do you know how happy that makes a gardener? Almost as happy as a bushel of ripe, red tomatoes. But he hasn’t stopped with The Funny Farm. Nothing is safe with SOG around. Now you can actually see outside on most of the two acres without breaking a hip. I’ll keep you updated on the ranch improvements. 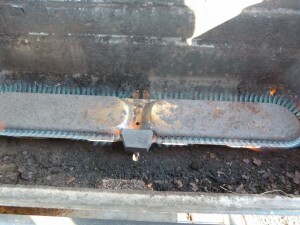 In fact, I’m thinking of making my Friday blog into Fix-it-Friday’s with great do it yourself tips. Let’s just see how that grill comes out first. It already blackens light a dream. Have a great weekend, enjoy the Super Bowl, the snacks and commercials. Talk to you on Monday. 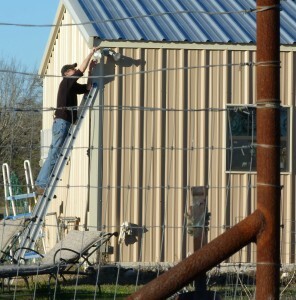 Spreading improvements throughout the world…one nail at a time. This entry was posted on Thursday, February 2nd, 2012 at 11:53 pm	and is filed under Dancing Dog Ranch. You can follow any responses to this entry through the RSS 2.0 feed. You can leave a response, or trackback from your own site.